The SkyCoord class provides a simple and flexible user interface for celestial coordinate representation, manipulation, and transformation between coordinate frames. This is a high-level class that serves as a wrapper around the low-level coordinate frame classes like ICRS and FK5 which do most of the heavy lifting. The SkyCoord object can maintain the union of frame attributes for all built-in and user-defined coordinate frames in the astropy.coordinates.frame_transform_graph. Individual frame classes hold only the required attributes (e.g. equinox, observation time or observer location) for that frame. This means that a transformation from FK4 (with equinox and observation time) to ICRS (with neither) and back to FK4 via the low-level classes would not remember the original equinox and observation time. Since the SkyCoord object stores all attributes, such a round-trip transformation will return to the same coordinate object. The SkyCoord class is more flexible with inputs to accommodate a wide variety of user preferences and available data formats. The SkyCoord class has a number of convenience methods that are useful in typical analysis. At present, SkyCoord objects can use only coordinate frames that have transformations defined in the astropy.coordinates.frame_transform_graph transform graph object. The SkyCoord class accepts a wide variety of inputs for initialization. At a minimum these must provide one or more celestial coordinate values with unambiguous units. Typically one also specifies the coordinate frame, though this is not required. Common patterns are shown below. In this description the values in upper case like COORD or FRAME represent inputs which are described in detail in the Initialization Syntax section. Elements in square brackets like [unit=UNIT] are optional. Notice that the first example above does not explicitly give a frame. In this case, the default is taken to be the ICRS system (approximately correct for “J2000” equatorial coordinates). It is always better to explicitly specify the frame when it is known to be ICRS, however, as anyone reading the code will be better able to understand the intent. Note that frame instances with data and SkyCoord instances can only be passed as frames using the frame= keyword argument and not as positional arguments. Finally it is possible to initialize from a low-level coordinate frame object. A key subtlety highlighted here is that when low-level objects are created they have certain default attribute values. For instance the FK4 frame uses equinox='B1950.0 and obstime=equinox as defaults. If this object is used to initialize a SkyCoord it is possible to override the low-level object attributes that were not explicitly set. If the coordinate above were created with c = FK4(1 * u.deg, 2 * u.deg, equinox='B1960') then creating a SkyCoord with a different equinox would raise an exception. In the above description, elements in all capital letters (e.g. FRAME) describes a user input of that element type. Elements in square brackets are optional. For non-spherical inputs see the Representations section. Single coordinate string with a LON and LAT value separated by a space. The respective values can be any string which is formatted for Creation of Longitude or Latitude objects, respectively. N x 3 numpy or Quantity array of values where columns are longitude, latitude, and distance respectively. BaseRepresentation subclass object like SphericalRepresentation, CylindricalRepresentation, or CartesianRepresentation. This can be a BaseCoordinateFrame frame class, an instance of such a class, or the corresponding string alias. The frame classes that are built in to astropy are ICRS, FK5, FK4, FK4NoETerms, Galactic, and AltAz. The string aliases are simply lower-case versions of the class name. If the frame is not supplied then you will see a special ICRS identifier. This indicates that the frame is unspecified and operations that require comparing coordinates (even within that object) are not allowed. If only a single unit is provided then it applies to both LON and LAT. RA and Dec for frames where these are representation, including [FIXME] ICRS, FK5, FK4, and FK4NoETerms. Galactic l and b for the Galactic frame. Distance from reference from center to source. If custom user-defined frames are included in the transform graph and they have additional frame attributes, then those attributes can also be set via corresponding keyword args in the SkyCoord initialization. Note that similarly to the ndarray methods, all but flatten try to use new views of the data, with the data copied only if that it is impossible (as discussed, e.g., in the documentation for numpy reshape()). The SkyCoord object has a number of useful attributes which come in handy. By digging through these we’ll learn a little bit about SkyCoord and how it works. Other attributes you should recognize are distance, equinox, obstime, shape. Together these tell the object that l and b are the longitude and latitude, and that they should both be displayed in units of degrees as a spherical-type coordinate (and not, e.g. a cartesian coordinate). Furthermore the frame’s representation_component_names attribute defines the coordinate keyword arguments that SkyCoord will accept. The key values correspond to the defaults if no explicit value is provide by the user. This example shows that the FK4 frame has two attributes equinox and obstime that are required to fully define the frame. The SkyCoord object exposes the frame object attributes as its own. Though it might seem a tad confusing at first, this a good thing because it makes SkyCoord objects and BaseCoordinateFrame objects behave very similarly and most routines can accept either one as input without much bother (duck typing!). The topic of transformations is covered in detail in the section on Transforming Between Systems. So far we have been using a spherical coordinate representation in the all the examples, and this is the default for the built-in frames. Frequently it is convenient to initialize or work with a coordinate using a different representation such as cartesian or cylindrical. In this section we discuss how to initialize an object using a different representation and how to change the representation of an object. For more information about representation objects themselves see Using and Designing Coordinate Representations. In this case the keyword_args now includes the element representation_type=REPRESENTATION. In the above description, elements in all capital letters (e.g. FRAME) describes a user input of that element type. Elements in square brackets are optional. Each representation component has a specified class (the “component class”) which is used to convert generic input data into a pre-defined object class with a certain unit. These component classes are expected to be subclasses of the Quantity class. List of (COMP1, .., COMP<M>) tuples, where each component is a scalar (not array) and there are M components in the representation. Typically there are 3 components, but some (e.g. UnitSphericalRepresentation) can have fewer. N x M numpy or Quantity array of values, where N is the number of coordinates and M is the number of components. The representation can be supplied either as a BaseRepresentation class (e.g. CartesianRepresentation or as a string name that is simply the class name in lower case without the 'representation' suffix (e.g. 'cartesian'). The rest of the inputs for creating a SkyCoord object in the general case are the same as for spherical. Each frame knows about all the available representations, but different frames may use different names for the same components. A common example is that the Galactic frame uses l and b instead of ra and dec for the lon and lat components of the SphericalRepresentation. units: defines the units of each component when output, where None means to not force a particular unit. The object prints itself in accord with the new representation. The available attributes change to match those of the new representation (e.g. from ra, dec, distance to x, y, z). 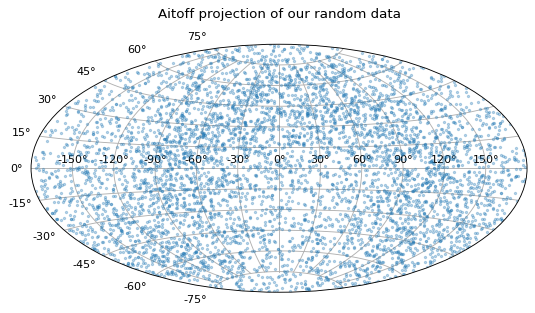 This is an example how to make a plot in the Aitoff projection using data in a SkyCoord object. Here a randomly generated data set will be used. First we need to import the required packages. We use matplotlib here for plotting and numpy to get the value of pi and to generate our random data. We now generate random data for visualization. For RA this is done in the range of 0 and 360 degrees (ra_random), for DEC between -90 and +90 degrees (dec_random). Finally, we multiply these values by degrees to get an Quantity with units of degrees. As next step, those coordinates are transformed into an astropy.coordinates SkyCoord object. As last step we set up the plotting environment with matplotlib using the Aitoff projection with a specific title, a grid, filled circles as markers with a markersize of 2 and an alpha value of 0.3. We use a figure with an x-y ratio that is well suited for such a projection and we move the title upwards from its usual position to avoid overlap with the axis labels. 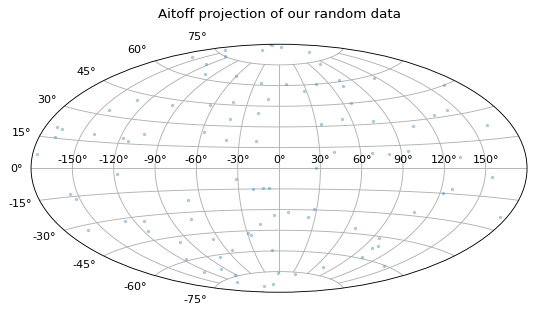 This is more realistic example how to make a plot in the Aitoff projection using data in a SkyCoord object. Here a randomly generated data set (multivariate normal distribution) for both stars in the bulge and in the disk of a galaxy will be used. Both types will be plotted with different number counts. As in the last example, we first import the required packages. We now generate random data for visualization using numpy.random.multivariate_normal. Addition information and examples can be found in the section on Separations, Offsets, Catalog Matching, and Related Functionality and Accounting for space motion.